Ex G4 tenor and musical performer Jonathan Ansell is playing Prince Valiant in the pantomime Sleeping Beauty at theWatersmeet Theatre in Rickmansworth from 6th-31st December. 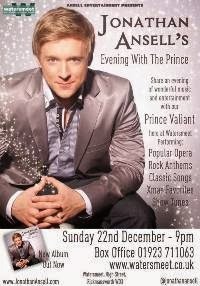 He will also be performing an Evening with the Prince concert for one night only at 9:00 pm on 22nd December. It will include popular opera, rock anthems, classic songs, show tunes and some Christmas favourites. Jonathan has also just released a new album Two Hearts which you can find out more about and order online by clicking on the link. The album Two Hearts is a wonderful album. Once you are playing it,you will have it playing on a loop. Jonathan is so talented and you be so glad that you have gone to his concert. So agree with Natalie Jonathan's new album is wonderful. Jonathan's vocals as always are completely stunning! Jonathan has got to have one of the most loyal fan bases I have come across which is well deserved. Just wish I could go to this but coming from Scotland it just isn't possible as I am coming down for the Panto the week before. Jonathan has such amaxing vocals and his personality just shines when you meet him face to face as he makes sure everyone has a bit of him before or after a show if they are waiting around.